It was just the tonic for a cold, bleak evening: eleven students from the Royal College of Music, picked from the cream of musical talent from all over the world, crowded onto the platform in the United Reformed Church on 25th January to present a delightful selection of string concertos by Vivaldi, Bach and Corelli. Performed on baroque instruments with no conductor, this was a truly democratic programme with all of the musicians having a chance to shine in solos or prominent passages as well as taking it in turns to introduce the pieces to the large audience. Vivaldi’s Concerto for 4 violins provided a lively and impressive opening, followed by the well-known Bach E major concerto with its anguished melody in the slow movement. The next Vivaldi offering gave cellist George Ross a chance to shine as well as violinists Emily Hale and Marie Oka in some fast and furious passages expertly handled. Another joyful Vivaldi concerto and an exuberant and beautifully played Corelli Concerto Grosso with Magda Loth-Hill and Louisa Tatlow as soloists, led to the pinnacle of all baroque orchestral music, Bach’s Double Violin Concerto in D minor. 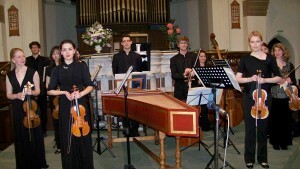 This demands not only virtuosic technique from the musicians but great empathy and sensitivity to one another, particularly in the slow movement. It was exquisitely and movingly performed by violinists Adelia Myslov and Olga Popova. Their Professor, TBS Director Adrian Butterfield, must be very proud of them. 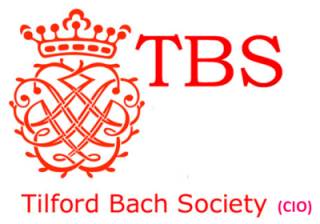 This was the first of Tilford Bach Society’s 2013 Farnham Concert Series and the first step in the Society’s search for a suitable regular venue now that the Castle is no longer available for performances. Thanks to the URC for making us so welcome.